ESEDatabaseView reads and displays the data stored inside a database used by a variety of Microsoft programs known as Extensible Storage Engine (ESE) database (aka Jet Blue or a .edb file). It displays a list of all tables available in the opened database file, allows you to choose the desired table to view, and then when you choose a table, it displays all records found in the selected table. The program also allows you to easily choose one or more records, and then export them into a variety of formats including CSV, HTML and XML, or copy and then paste them into a spreadsheet program. How to extract: Download the ZIP package and extract to a folder of your choice. Launch ESEDatabaseView.exe. "ESE is notably a core of Microsoft Exchange Server and Active Directory. Its purpose is to allow applications to store and retrieve data via indexed and sequential access. Windows Mail and Desktop Search in the Windows Vista operating system also make use of ESE to store indexes and property information respectively." Well that sure clears that up lol, but really like many apps a user has a need and finds a solution that works for them and then passes along their work for others to freely use. In my mind that's the way its supposed to be. 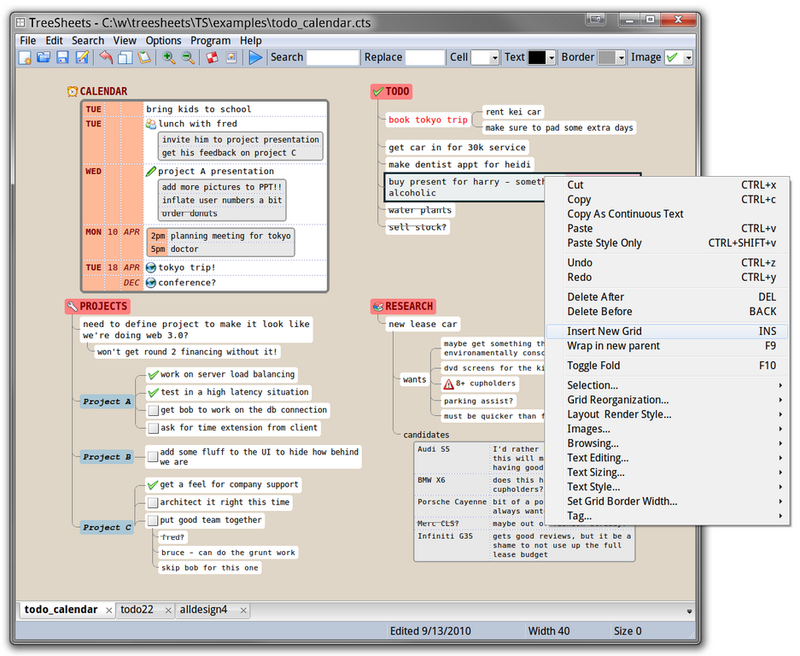 TreeSheets is a mashup of many different program types including spreadsheets, mind mappers, outliners, PIMs, text editors and small databases. It has a tabbed interface and is lightweight and fast, using few system resources even with large files. It's like a spreadsheet, but much more suitable for complex data because it's hierarchical. It's like a mind mapper, but more organized and compact. It's like an outliner, but in more than one dimension. It's like a text editor, but with structure. It is capable of many kinds of data organization, including todo lists, calendars, project management, brainstorming, organizing ideas, planning, requirements gathering, presentation of information, etc. Functional in 64-bit and cross platform (Linux and Mac). Writes settings to: Application folder. All settings written to TreeSheets.ini. @Realist: so the program is rubbish because you don't understand how it works and what it does. Why are you feeding the troll? Movie Info Search is a tool for searching various cinema-related online databases, chiefly the Internet Movie Database (IMDB). 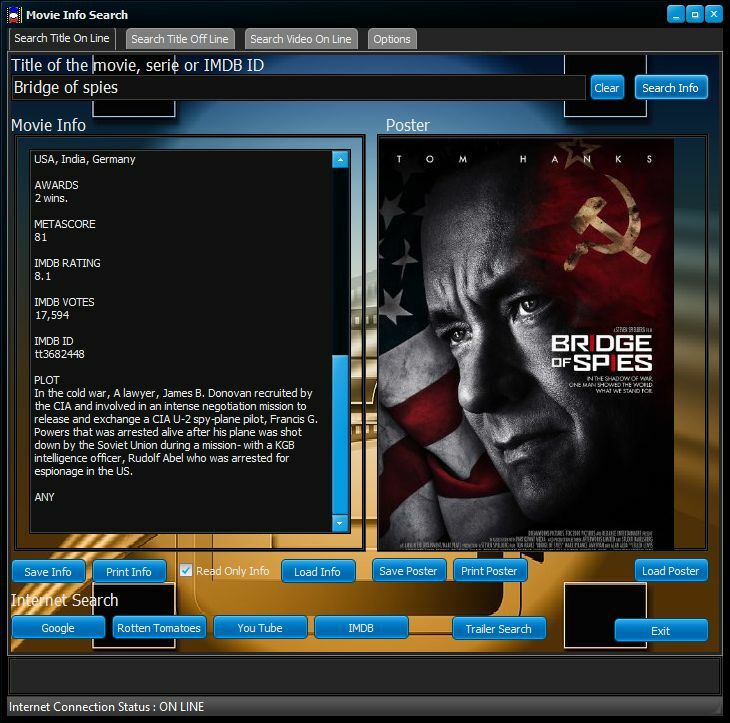 The user can save selected movies' information and images, as well as manage a personal offline database. Writes settings to: None. On user demand, an Options.ini will be saved to application folder. How to extract: Download the ZIP package and extract to a folder of your choice. Launch MovieInfoSearch.exe. Can't find what you are looking for? This list shows entries with Others - Database Tools as a supplementary function. You can view more entries with Others - Database Tools as a primary function.